Would Shawn Michaels finally realise his boyhood dream of becoming the World Wrestling Federation Champion, or would reigning champion Bret Hart leave California with the his beloved title still around his waist? Tonight, we were set to find out in one of the highly anticipated matches of 1996. Other matches were set to take place too, but for all intents and purposes, this entire show was built around two of the biggest stars of the 1990s. Let's head to the video and take a look at what went down, shall we? 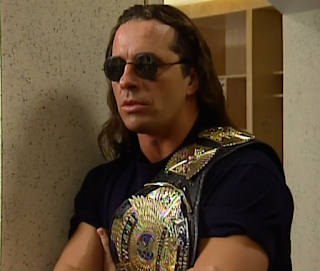 Our event tonight begins with a dramatic hype video for tonight's WWF Championship Iron Man Match between Bret 'The Hitman' Hart and 'The Heartbreak Kid' Shawn Michaels. Shown entirely in black-and-white, the video (which I sadly can't find on Youtube), did a great job of making the hotly-anticipated match feel like not only the most important wrestling match ever, but also a legitimate sporting contest in which both men would really lay it all on the line for the most prestigious title in pro wrestling. The video was followed by the famous Wrestlemania theme, and a welcome from our hosts, Jerry 'The King' Lawler and Vince McMahon. Lawer and McMahon ran down some of tonight's matches, including the upcoming Diesel/Undertaker clash, and the Hollywood Backlot Brawl between Goldust and Rowdy Roddy Piper. Yet it was neither of those matches which would get us underway tonight. That honour went to a six man tag team bout which heralded the first of just a few pay per view appearances for Yokozuna as a baby face, and also the pay per view debut of Ahmed Johnson. Despite featuring the usually conform talents of Davey Boy Smith and Owen Hart, this opening contest failed to live up to what it could have been. 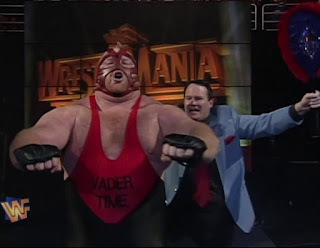 Though it was saved from being a total snooze-fest thanks to the opening six-man melee and a couple of smashmouth exchanges between Vader and Yoko, the majority of the match saw the heels beating mercilessly on Jake 'The Snake' Roberts, much to the general apathy of the Anaheim faithful. Yoko did eventually turn the tables for his team, but it was too little, too late. The former two-time WWF Champion got himself beat up at ringside whilst Vader -who to be fair looked excellent in this match- finished off Roberts for the three count. The stipulation that Yokozuna would get five minutes alone with Jim Cornette if his team won the match was ignored and never spoken of again. With the victors making their way backstage, Vince and King began to hype up our next match, pitting Goldust and Roddy Piper in what McMahon very clearly referred to as a Hollywood Backlot Bra. A clip of Marlena settling in to watch the action from her dressing room was shown, and with that, it was on to the fight. 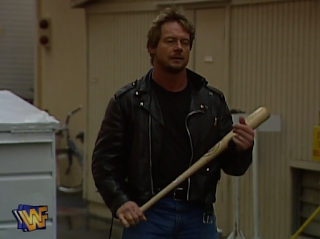 In a pre-taped opening segment, cameras panned to the erm, Hollywood backlot, where a visibly pissed-off Roddy Piper stood waiting, baseball bat in hand. Godie arrived a few seconds later in a golden (what else?) Cadillac, and was promptly beaten every which way by an incensed Hot Rod. I remember quite clearly that as a 12 year-old kid I thought this match was just about the coolest thing I'd ever seen, simply because it was -for a child who grew up on New Generation WWF- so different from anything else I'd seen. With the benefit of hindsight (or perhaps its just old age cynicism), I'm willing to call this segment what it was; a mildly entertaining brawl which served as a nice change of pace from the evening's in-ring action. Speaking of action, the majority of the "match" so far largely saw Roddy kicking seven shades of holy moly out of his rival until The Golden One returned to his car and ran Piper over. Making a miraculous recovery just seconds later, Piper returned to his own vehicle, and chased Goldust out onto the highway. In a typically cheesy babyface promo that was still somehow strangely effective, Carribean Sensation Savio Vega spoke to Doc Hendrix about his joy at finally making it to Wrestlemania, and how the occasion was made all the sweeter by the opportunity to even the score with Stone Cold Steve Austin. Tonight's match finds the man who would go on to be the biggest star of the Attitude Era in a weird, transitional phase of his WWF tenure. Despite dropping the 'Ringmaster' moniker, in favour of the now-famous 'Stone Cold' tag and displaying early signs of the permanently-pissed-off attitude that would make him such a star, Austin was still accompanied by his old Ringmaster music, The Million Dollar Man Ted Dibiase as his manager, and the Million Dollar Championship. 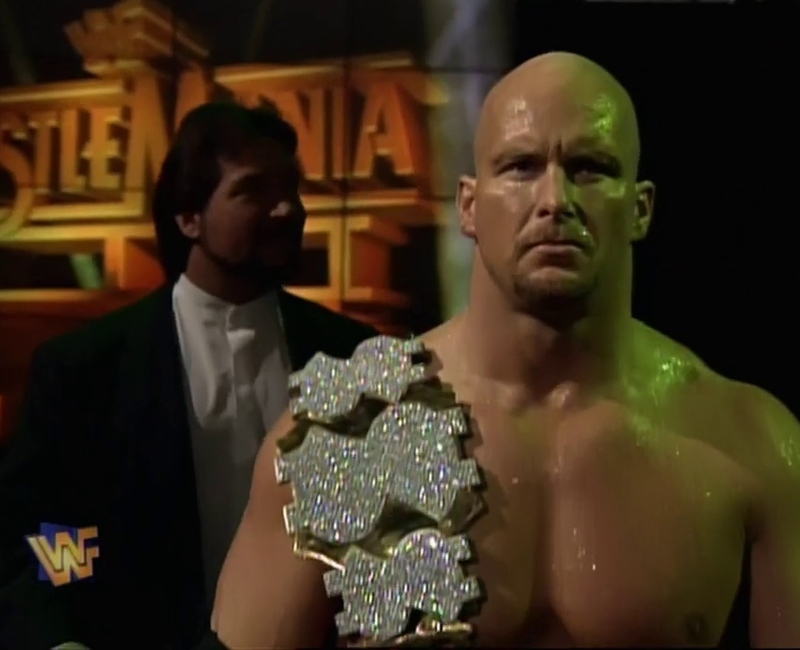 It's also worth noting that this was the better part of 18 months prior to being dropped on his head and changing his style to that of a brawler, meaning this version of Stone Cold Steve Austin could go with all the skill and agility displayed in his WCW heydey. And man, did he go. Though largely ignored given the remainder of his body of work, Austin's Wrestlemania debut was nonetheless an impressive outing, taking the mediocre Vega through a fun little match before putting him out of his misery courtesy of the Million Dollar Dream. Your Winner: Stone Cold Steve Austin. What I didn't mention during the above recap, was that during the bout, Vince McMahon managed to get hold of Roddy Piper on the phone as cameras showed us the WWF President chasing Goldust through the highways of California. Another clip of this was shown prior to our next interview. Back in the locker room, Mr. Perfect reminded Big Daddy Cool Diesel of his recent rivalry with The Undertaker. For his part, Diesel -now a fully-fledged heel- declared that despite Undertaker's size, he would defeat him, before going on to challenge Shawn Michaels for the WWF Championship. This despite Shawn not yet having the belt. Another debut next, as Sable made her first appearance on our screens on the arm of Hunter Hearst Helmsley, who was also putting in his first of many Wrestlemania appearances. Yet it was neither the future Attitude Era pin-up nor the future multi-time world champion that was the star attraction here. 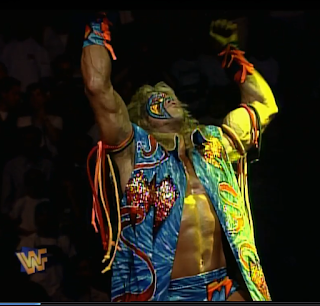 No sir, that honour went to the highly anticipated return of The Ultimate Warrior, a man not seen on WWF telivision since before the 1992 Survivor Series. I'd say that this match was garbage, but let's be honest, this one was never supposed to be about having a competitive pro wrestling match, it was all about the spectacle of the Warrior's return, and to that end, it delivered. In the opening seconds, Triple H got in his only bout of offence by drilling Warrior with a Pedigree, only for the former World and Intercontinental Champion to completely no-sell the move. A few clobbering blows, clotheslines, and the inevitable Big Splash of Doom later, and that was all she wrote. Marc Mero made his first WWF appearance in a promo with your mate and mine, Todd Pettingill. Mero claimed that he'd waited 'five long years' to get to the World Wrestling Federation without once mentioning his time as Johnny B. Badd, then said some other stuff about the fire which burns in his eyes that made little sense. Mero's promo was interrupted by an irate Hunter Hearst Helmsley, who first took out his frustrations by yelling at Sable, before turning his attention to the 'Wild Man.' A short brawl ensured, before we cut back to the roads of Anaheim, with Vince McMahon telling us that Goldust was on his way to the arena to see Marlena, and Roddy Piper was on his way to, well, presumably to beat the stuffing out of Goldie. 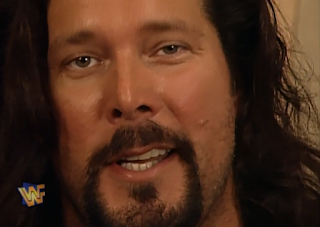 I'll admit to being a little disappointed whenever I criticism's of Kevin Nash' in-ring performance. Sure, he was no Eddie Guerrero, Bryan Danielson, or Shawn Michaels, and sure his WCW run left a lot to be desired in terms of bell-to-bell action, but during his WWF run, Big Daddy Cool more often than not came up with a decent offering when it came to big-time Pay Per View bouts. And whilst this match wasn't as good as his earlier encounters with Bret Hart and the aforementioned Heartbreak Kid, with both he and Undertaker playing to their strengths here, this was at least an entertaining battle of the big men. After a ferocious brawl in the early moments, the match did admittedly slow down tremendously for a spell, though even then, Nash's natural heel charisma and the fan's unwavering devotion to The Phenom were enough to maintain this writer's interest. As you may expect, Big Daddy Cool controlled much of the contest, and, given the legend of The Streak, you don't need me to tell you that The Dead Man eventually made a comeback, planting Diesel with a chokeslam and a rather wobbly Tombstone piledriver to pick up the win. Backstage, Todd Pettingill just happened to be conveniently watching Roddy Piper and Goldust's big chase on the security monitors as the two men arrived at the arena. In the culmination of this unique match-that-wasn't-really-a-match, Piper stalked Goldust through the backstage area and out to the ring. There, Goldust took the advantage, pummeling Piper into the corner, working over his leg, and eventually choking him out with Hot Rod's own t-shirt. "This one started in a Holywood Backlot Bra," McMahon reminded us on at least two occasions, making this fan wonder whether he wasn't actually making some inside joke rather than repeatedly failing to pronounce the word brawl. With the crowds firmly behind him, Piper eventually turned the tables, beating up on his adversary and stripping him of his gold suit, revealing that Goldie had been wearing stockings, suspenders, and a corset the whole time. Sort of brings new meaning to the phrase backlot bra, doesn't it? 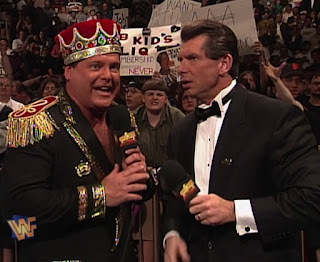 With that out of the way, there was only one thing left on tonight's show; an epic, hour-long showdown between two of the biggest stars of the 1990s. Before we got to the action, we saw pre-taped interviews in which both champ and challenger appeared calm, focused and ready, each man separately agreeing that the only thing left to do was to make it happen. Over the years, I've seen various people give mixed reviews of this epic main event, with some declaring it close to a full-on masterpiece and others deriding it as little more than a slow, long-winded, and not terribly exciting affair. It's fair to say I fall somewhere in the former camp. No, I don't think this is a five star, grade A, perfect match, but I do admit to thoroughly enjoying it, even if I do wonder whether part of that enjoyment has to do with a certain nostalgia factor. The moment that Shawn Michaels descends from the rafters on a zip line in a moment played literally thousands of times on WWE television since, a little chill of excitement rushed through my spine. This is the pro wrestling of my childhood, and I can't help but enjoy it for that reason, but with age and experience comes the benefit of a certain appreciation for just how talented both Michaels and Hart were. Together, the two delivered a fantastic performance. Admittedly, the bout did drag on a little through the 20 - 40 minute mark, but the closing moments were as good as anything this fan has ever seen, and when Shawn Michaels finally fulfilled The Boy Hood Dream during the sudden-death overtime period, it was both the culmination of a terrific bout and -at the time- the start of my lifelong admiration of The Heartbreak Kid. And that was another Wrestlemania in the bag. On the whole, this was far from the worst 'Mania in history, though it was abundantly obvious that tonight was all about one thing and one thing only; finally putting the WWF Championship around the waist of Shawn Michaels. On the undercard, the Steve Austin vs. Savio Vega was a surprise highlight, whilst the Hollywood Back Lot Bra Brawl served as a welcome change of pace, even if the whole thing does seem a little ridiculous in hindsight. 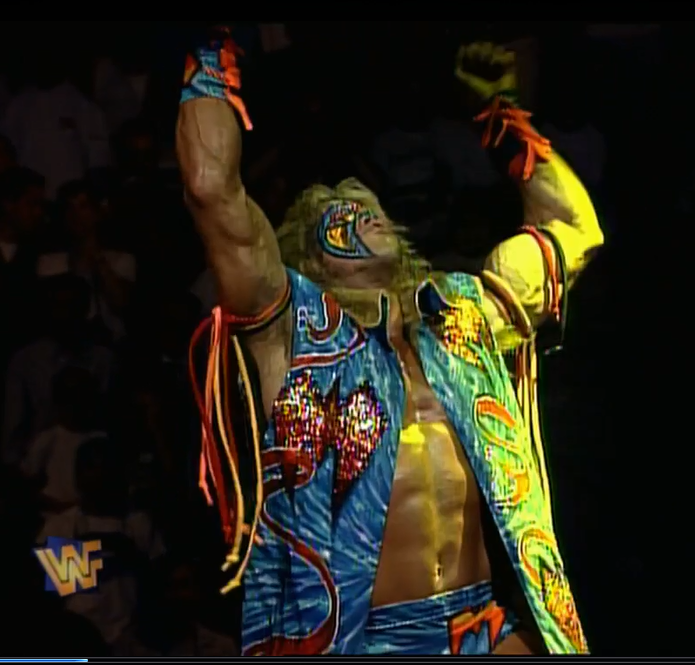 On a final note, thanks for sticking with me and reading this Wrestlemania 12 review. 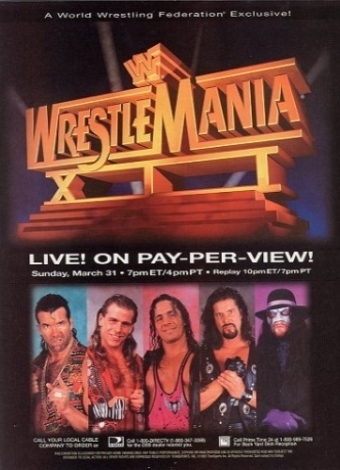 A combination of real life responsibilities and a lack of enthusiasm for the current WWE product means I just haven't been able to commit to the Retro Pro Wrestling Blog as much as I would like, but, as ever, I will keep plugging away in the hopes that I can recapture some of that magic that I felt when I first watched Wrestlemania 12 back in my childhood.